Let us derive the theoretical 16QAM bit error rate (BER) with Gray coded constellation mapping in additive white Gaussian noise conditions. 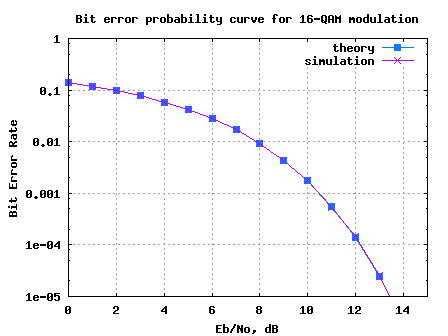 Further, the Matlab/Octave simulation script can be used to confirm that the simulation is in good agreement with theory. As we discussed in the previous post on Binary to Gray code for 16QAM, the 4 bits in each constellation point can be considered as two bits each on independent 4-PAM modulation on I-axis and Q-axis respectively. For very low value of , it may so happen that the noise causes the constellation to fall near a diagonally located constellation point. In that case, the each symbol error will cause two bit errors. Hence the need for approximate operator in the above equation. However, for reasonably high value of , the chances of such events are negligible. (g) Running this for each value of Eb/No in steps of 1dB. sir can u help me? Sir, I need to calculate the BER for uncoded 16QAM in AWGN. Can u suggest the modifications required. Well, I had found a paper on it http://perso.ensil.unilim.fr/~meghdadi/notes/ber_awgn.pdf . But the result of equations mentioned in this paper are not matching with the result of MATLAB function. Please help me for the changes required. i have a query why cant we use grey coding for 32-bit Cross QAM? btw I am just curious why you have not given any code for odd number of bits per symbol cross QAM or rectangular QAM? @sara: Glad that you are able to visit the blog – not sure about the issue. Digitial communication is a vast topic – have only have a handfull of articles in this blog. I have not read much about rectangular QAM. Will study and revert. First of all, congratulations for this blog which is very interesting. 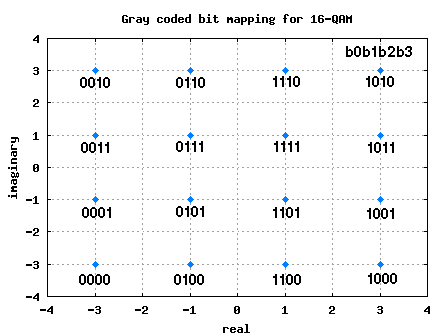 I was wondering if you ever try to apply Grey mapping to a binary PCS code? I’ve been trying by finding the periodic autocorrelation function first but then it gets kind of confused. If you ever try this before, could you probably give some guidence how to tackle it/ I will really appreciate. @Francisco: Sorry, I have not tried this. Can you point me to some references on binary PCS code? tank you for your site… it is fantastic. I want to simulation convolutional code with viterbi algorithm . . . I need to help for MATLAB code! The post on Viterbi decoder describes a rate 1/2 K=7 convolutional encoder and its corresponding Viterbi decoder. can you plz post the steps to run this program? @mohammad: Are you able to get zero errors if you do not add noise? sir i need MMSE equalizer for 16 QAM. @Anita: Is it a 1tx-1rx system? I am working on the viterbi decoding of the rate1/2 convolution encoder of constraint length 7. I am facing difficulty in coding the state metric and traceback unit of viterbi decoder on matlab as there will be 64 states. could you please help me out in this. carrier frequency is 12 GHz. Assume perfect synchronization. versus Eb/No. Compare the results with what you obtain in theory. b) Consider (15,11) Hamming code. Apply this code into the above system. Compare the results with what you obtain in theory. mobile speed 42.3 Km/Hour. No equalizer is used in the system. f) Discuss all the results. I’ve just gone through some of your tutorials and I really appreciate the work you are doing. I’ve just subscribed to your feed and will appreciate if you could send me the free ebook as well. Sir can u provide me the program for QPSK in Rayleigh fading environment along with error performance..
Hy . I think you might have some errors in your results. You have to divide your result by 2 otherwise when you have low SNR your error rate will be above 1. I need to calculate Matlab code for 64 QAM BER! I wonder how to change the code you wrote for 64 QAM SER to 64QAM BER ? Please could you explain, I should know it as soon as possible. For BPSK AWGN AND BPSK RAYLEIGH , Eb = 1 already. But for 16-QAM, Eb=2.5 by doing theoretical calculation and also what you did in your 16-QAM script. Now how shall I make Eb=1 for 16-QAM case so that I can compare this 16-QAM with BPSK AWGN AND BPSK RAYLEIGH? Please kindly help me in this above problem. @Hassan: To normalize the power for 16QAM constellation, scale it by 1/sqrt(10). Hopefully, you can adapt the simulation in the above post for 16QAM case. i am mid way in matlab.i mean not very good and not very bad. i am simulating and implementing the practical adsl environment in matlab. please help me regarding it. please help me in 16 qam modulation.any one send me the matlab code of 16 qam modulation. I was in need the performnce of bit error rate in pre-ffT and postfft at frequency selective fading . what would I do if I had this case ? I am having a problem seeing how I would factor in the number of users, and the processing gain, of a CDMA system for the Probability of Bit error…. I am assuming that the Gp and the number of users, would be factored into the value for Eb but I’m not sure. Can you give me some direction on this? @Preston: Well, I did not quite understand how you are using 16QAM Gray mapping to the CDMA case? In the CDMA case, I would expect you to have a code for each user. if I use a real noise, what is the value of the variance ? @Fritzou: If you dont use complex, then the variance will be down by 3dB. i’m new to matlab and have problem to modulate the 64QAM bit error rate. how do i change the code u wrote in 16QAM to 64QAM or 256QAM? every help is much appreciated. sir, i am new here. How i can add convolution encoding & viterbi decoding within the code. 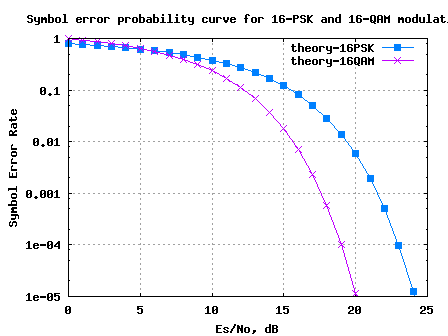 Are the code same for 16psk & 16qam?? ?if u have code pls write. ” channel estimation and predicition for adaptive OFDM links”. @venkat: Sorry, I do not have the Matlab code. Your blog helps me a lot! 1)what’s the difference using Es/N0 or Eb/N0? 1) Es/N0 refers to symbol to noise ratio and Eb/N0 refers to bit to noise ratio. For eg, in 16QAM, each constellation symbol carries 4 bits, so Es/N0 = 4Eb/N0. Hi, I have found your matlab code on the 16qam ber with gray code on the site http://www.dsplog.com and I have two question to ask you please. 1) What is the difference between “16qam ber with gray code” and “16qam ber without gray code”? 2) How do you get the theoretical expression of any M-aire qam ber.? can you give me the corresponding expression of the 64-qam.? 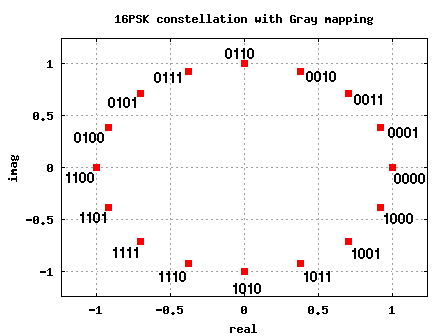 1/ With Gray coded mapping, the bit loading into adjacent constellation symbols differ by only one bit. So, each error in constellation symbol typically results in one bit being in error. Without Gray coded bit mapping, this assumption is no longer true.